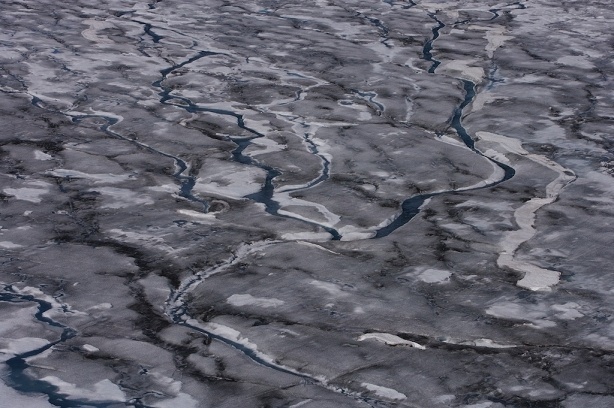 Runoff of melt water on the Greenland ice sheet near Nordlit Sermiat, Greenland (61°05’ N, 46°27’ W). © Yann Arthus-Bertrand/Altitude. Greenland seemend stable until 2007, when scientists realised that 50 to 100 billion tonnes of its ice had melted between 1993 and 2003. The phenomenon has been picking up speed since then, and satellites now monitoring the situation have made it possible to observe that ice is melting everywhere on the world’s biggest island. Many factors account for this. The main one seems to be that even a slight melting, which is normal during the summer, creates water current that flow under the ice cap to reach the bedrock. Water between ice and rock acts as a lubricant and causes the ice to dislodge and slide into the sea. If Greenland’s ice cap melts completely, the ocean will rise by nearly seven metres.